Your newborn baby is at home now, and you're settling into a daily routine. Keeping your baby warm and nourished comes top on your list. Baby skin care is just as important. Newborn skin is delicate, and so is the baby's immune system. Chemicals, perfumes, and dyes in clothing, detergents, and baby products can cause newborn skin irritation, dryness, chafing, and rashes. However, there's much you can do to protect your baby from these skin problems. The good thing about baby's skin sensitivity? Your touch on your newborn's skin has a soothing, nurturing effect, and is critical to your baby's development. A newborn baby is born with wrinkly skin and a protective covering called vernix that peels off. This is a natural process during the first week. There's no need to hurry it, rub it, or treat it with lotions or creams. (If baby is born after the due date, this process is likely to be complete before birth.With newborn skin care, "less is more." Doctors advise that bathing babies too often -- plus too much exposure to chemicals and other potential allergens, can lead to skin problems later in life. Don't use baby products in the early months. The immune system is still developing. If you have a family history of skin problems, allergies, or asthma, it's especially important to protect your baby's immune system, and protect baby from irritating allergens. Wash baby's clothing before it's worn. Only use baby washing detergents that are fragrance and dye free. Wash baby clothes, bedding, and blankets separately from the family's laundry. Give everything an extra rinse. Resist the urge to bath your baby frequently. 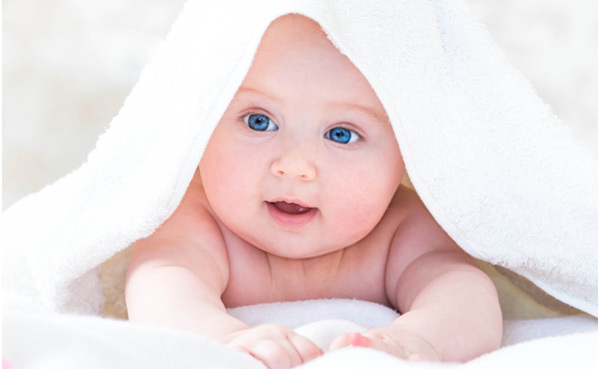 Too much bathing removes the natural oils that protect baby's skin. That leaves baby's skin vulnerable, so it reacts to any potential allergen, triggering a reaction like eczema. Except for dribble and nappy changes, newborn babies don't get very dirty. Babies aren’t working 9 to 5 and going to the gym afterwards! For the first month or so, a sponge bath two or three times a week will keep your baby safely clean. In between, simply clean baby’s mouth and nappy area with a little water or cleanser. 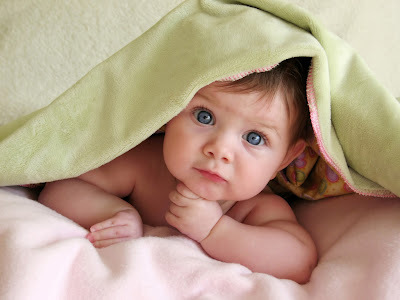 Most newborn skin problems, such as eczema or nappy rash, don't develop for the first month or two. Eczema appears as a red, itchy rash mostly on face and scalp, at the elbows, and behind the knees. Try bathing once a week to allow skin to retain natural oils. Limit your use of baby skin products. If necessary, use only a small amount of lotion on dry skin areas. Make sure baby wears only soft clothing.Check with your doctor about using over-the-counter lotions or creams to treat eczema. You may need a prescription treatment.Very few babies have the perfect skin the media would have us believe! Up to 1 in 3 babies is born with some sort of birth mark, with names like mongolian spots, stork marks or strawberry naevi. Most of them are nothing to worry about. Within their first few months of life, babies get all sorts of rashes and skin problems. • Strange as it may seem, water can dry your baby’s skin out. For the first few months of life, don’t bathe them every day. A bath every two to three days is fine, with ‘topping and tailing’ in between. If your child has eczema, your doctor can advise about emollients (moisturisers) as well as bath products. •Simple unscented emollients are the mainstay of treatment for eczema. They replace moisture and prevent moisture loss from the skin. However, they only last for a few hours, so need to be reapplied several times a day. •To minimise the chance of nappy rash, change nappies frequently and apply barrier cream to protect their skin from urine. Keep your baby’s skin open to the air indoors as much as possible – lie him on a towel to catch any spills! •Lots of babies are born with tiny white or red pimples around their nose, lips and eyes, or develop them within a few weeks of birth. They’re called milia or milk spots, and they don’t need any treatment unless they get inflamed and sore-looking. If they do, see your GP or health visitor. Consider using a fabric conditioner that has been designed for sensitive skin – the benefits of the softening effect on the fibres can outweigh any possible risk of irritation by the ingredients. Look for the British Skin Foundation logo for reassurance. Ideally, wash new fabrics before you put them on your baby to keep them feeling soft.